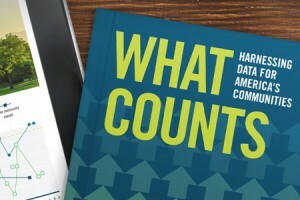 What Counts: Harnessing Data for America’s Communities, from the Federal Reserve Bank of San Francisco and the Urban Institute, outlines opportunities and challenges for the strategic use of data to reduce poverty, improve health, expand access to quality education, and build stronger communities. It is a response to both the explosive interest in using data to guide community initiatives, investment strategies, and policy choices, and the vexing questions that accompany data-driven approaches. The volume brings together authors from community development, public health, education, finance, and law to offer ideas for using data more meaningfully and effectively across sectors and institutions. What Counts is not focused on finding one right answer; rather, it is meant to serve as the basis for smarter conversations about data going forward. What Counts builds on key themes of a 2012 book—Investing in What Works for America’s Communities—that was published by the Federal Reserve Bank of San Francisco and the Low Income Investment Fund. What Works calls on leaders from the public, private, and nonprofit sectors to recognize that they can achieve more by working together and by using data to gauge the context and reach of their efforts.